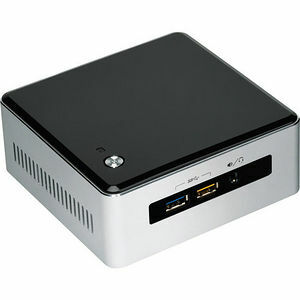 Equipped with a 5th generation Intel® Core™ i7-5557U processor, NUC5i7RYH is the highest performing Intel® NUC ever. Iris™ graphics 6100 delivers amazing multimedia experiences and makes NUC5i7RYH perfect for immersive gaming. A replaceable lid provides plenty of options to extend system capabilities or add personal style. Intel® Turbo Boost Technology 2.0 delivers performance that adapts to your needs. Add a 2.5-inch HDD or an M.2 SSD for more storage. Complete with Wi-Fi 802.11ac wireless, Bluetooth, and 7.1 surround sound, NUC5i7RYH is ideal for home theater PCs, media server PCs, and home hubs.